These three things make Robert Appleton's Prehistoric Clock a book after my heart. And does it capture it? Does the book provide a fun and engaging story along with its interesting premise? And thank goodness for that. When I read the synopsis, I so wanted to like the book, but I worried it wouldn't live up to its potential. Set in 1908, Prehistoric Clock is told from the perspectives of three main characters, Verity Champlain, an acting captain of an airship, Lord Garret Embrey, an aristocrat wrongly accused in a conspiratorial trial, and Cecil Reardon, the inventor who creates the time machine that drives the plot behind the novel. Though Reardon's scientific experiments are sponsored by a shady organisation called the Leviacrum (which we are given to suspect also controls the British empire), he secretly builds a time machine which he intends to use to go back in time to save his wife and son from dying seven years earlier. Of course, something goes wrong, and instead of sending Reardon back in time, the time machine sends a large chunk of London back in time. Not just seven years, but to the prehistoric age. Champlain's airship and Lord Embrey get caught in this time bubble as well, and not long after arriving in their new era, they unite to try survive and find a way back to their own time, but not without some initial misgivings. The story starts by focusing on the survivors but as they explore their surroundings using Champlain's airship, the author pulls back the curtains just a tiny bit to let us know that this prehistoric land is hiding something much more sinister than just dangerous reptiles. The characters are commendable. Verity Champlain is a no-nonsense female who knows how to gets things done and commands respect from her crew. She harbours a great regret, in that she wasn't around to save her beloved sister from a rebellion in Angola, a rebellion that incidentally, Embrey, along with his father and uncle, is accused of starting. That provides some tension between the two and though Garrett Embrey maybe a toff, he is also tough, being somewhat of a seasoned gentleman explorer. Armed with two steam-powered pistols, Embrey is the typical macho hero of pulp adventures who can do no wrong. He is the lovable rogue of the story and there's nothing wrong with that. Cecil Reardon starts out as somewhat of a foolish and selfish character, but we soon become sympathetic with him as the story moves along. What I really liked about him is that he becomes much more important later in the story than is let on, but I'll let you discover that one out for yourself. 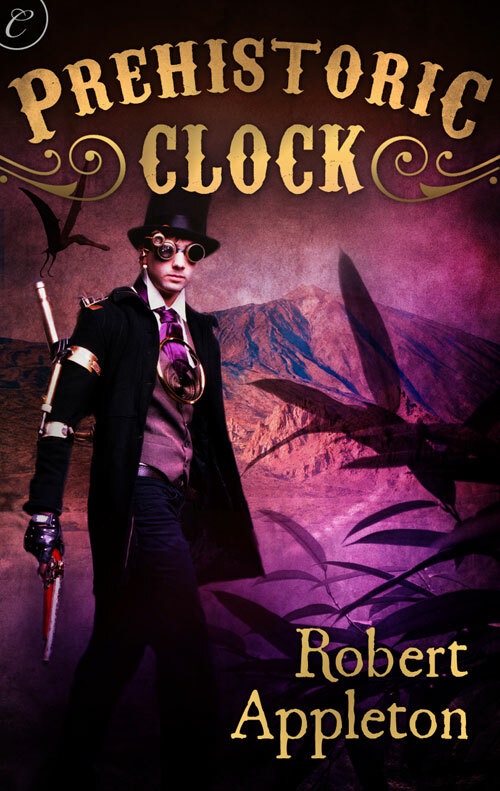 Prehistoric Clock is a wonderful novel in the spirit of pulp adventures by H. Rider Haggard and Edgar Rice Burroughs and is the first book of a series. If you love page-turning thrills with a dash of romance, here's a book for you. But really, you should have bought it the moment you read "steampunk, time travel and dinosaurs". Prehistoric Clock can be bought via the Amazon Kindle store. For more on the author, Robert Appleton, you can visit his website or check out his blog.